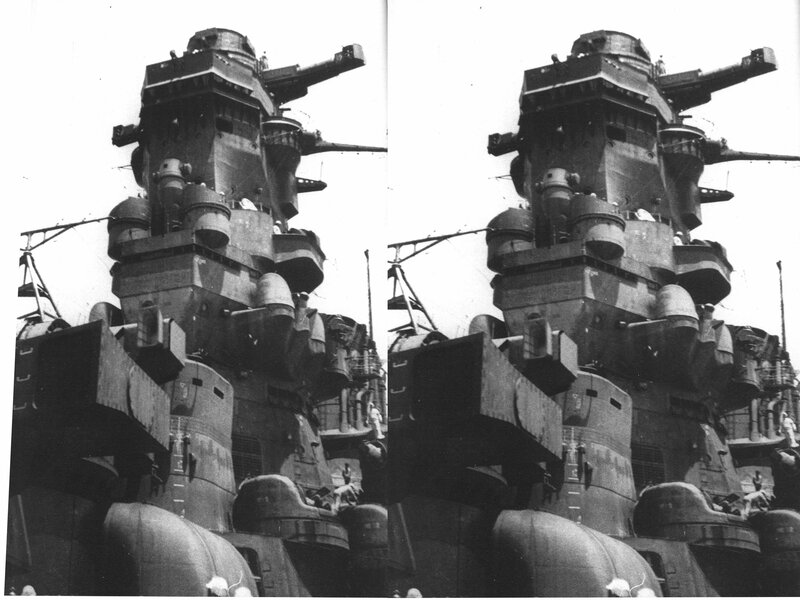 The provenance of this stereophotograph of the World War II Japanese battleship Musashi isn’t indicated online, but a lot of its art history is preloaded. The shell-deflecting curves of the ship’s armor, for instance, are prominent in its image for reasons having to to with the history of Art Deco, and the camera’s heroic angle, gazing raptly upward, was probably designed in the studio of Alexander Rodchenko, artist of the totalitarian. Then too there is the matter of the photograph’s dramatically dark tones, which were probably generated in-camera by a red filter. 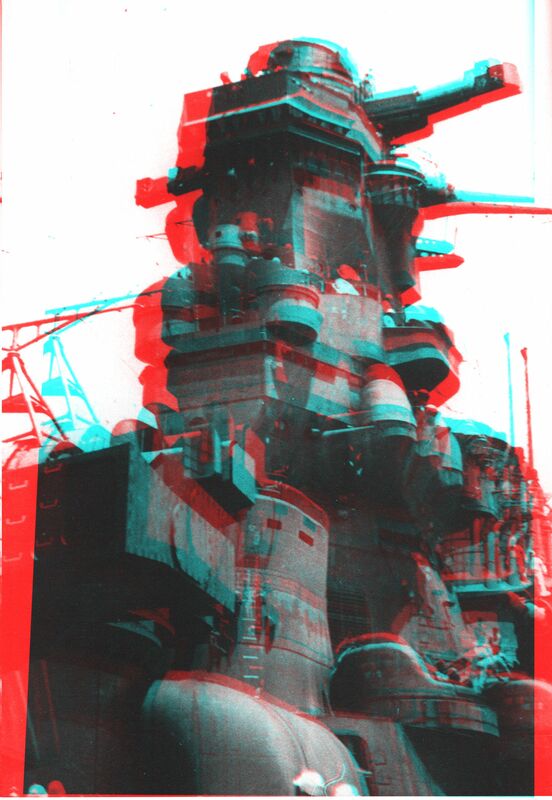 In the eye, then, per design, the twinned Musashi artworks, one image for the left eye and one for the right, are massed and ungraspable and black. Blocking out the light, they push together into your senses, take control, and merge into a single black ingot. After that, the ingot is no longer something capable of being seen, in the light, from without. It has become the material for a stamping mill broaching darkness within. Forty years earlier, a different ship in a different world looked as innocent as a maiden as it struck a happy pose and waved its flags with both hands. The ship was wearing white, too, and the camera was looking down at it as if it were little. I can imagine Musashi having been photographed by a professionally adoring, professionally upward-gazing modernist woman like Margaret Bourke-White or Leni Riefenstahl, but the idea of a happy little boat seems to have brought out something protectively chivalric in Messrs. Underwood and Underwood’s cameragentleman. But the happy little boat happened to be another battleship, with a battleship’s single purpose. Guns got bigger and armor got thicker in the course of the battleship’s half-century of naval dominance, but from the beginning of the era to the end, the corpses floating in each successive wake followed only one model of naked form. If the older corpses seem somehow simpler than the more recent ones, that’s only because more of their historical detail has been eaten by the fish. This believing in an illusion of simplicity is an ordinary error committed by beginners at living in time. Because we were once younger and more ignorant than we are now, we think the world was younger and more ignorant too. But in these two particular artworks, the error can be corrected by a simple trip to the eye doctor. The corrective process isn’t just good for us, either; it’s also educational. Go ahead with it, then. To begin the process of correction, assemble each stereo pair into an anaglyph. 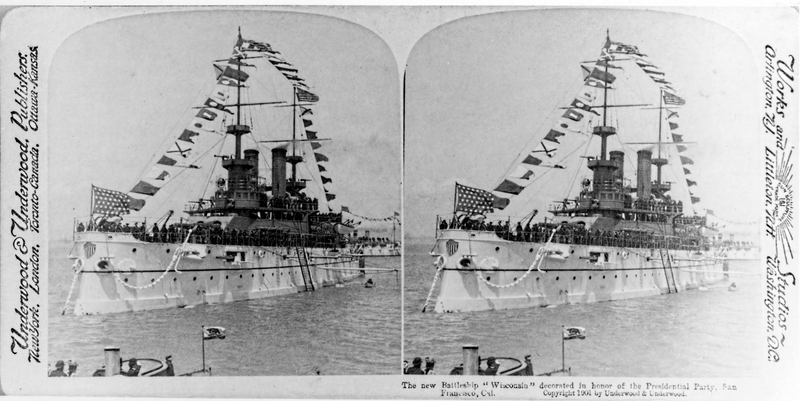 Then bring the two anaglyphs into juxtaposition. This formal art-maneuver will reduce the historical distances between the two images — distances across time, distances between democracy and fascism — to almost nothing. After that, with history controlled for and minimized, there will be little for the eye to do except see. Once they’ve been brought together at a single moment, the two images from different times will simplify to a single timeless idea. It will be what the two otherwise different battleship images have in common: a battleship idea, the idea of that which is death-dealing. Having been subsumed into a general idea of the death-dealing, each separate death-dealing image can shed its distracting photographic artifacts of (on the one hand) black and (on the other) white. The polychrome stains of life and death will then become imaginable again, and after that we’ll need to do just one more eye exercise. It will be this. To see the colors as they were before they became a part of history’s blacks and whites, we will only have to unlearn the way of seeing that we once learned from a block of black steel. Online, I’ve been able to find the image of Musashi only in an otherwise unidentified list of World War II photographs. The image of Wisconsin is at the U.S. Navy’s Naval History and Heritage Command, http://www.history.navy.mil/our-collections/photography/us-navy-ships/battleships/wisconsin-bb-9/NH-100334-A.html. I’ve photoshopped it for contrast. 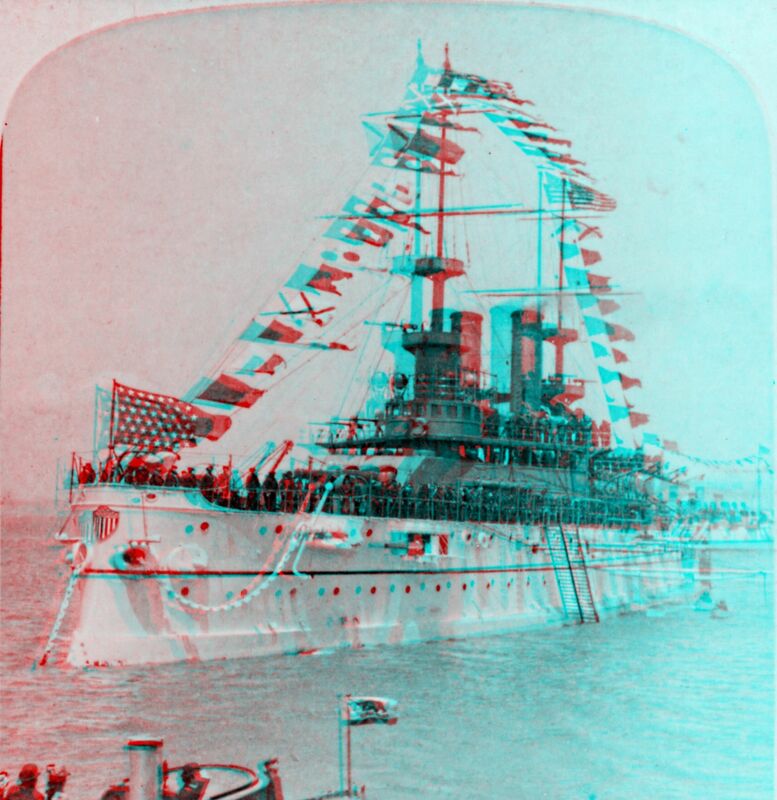 The anaglyphs require a red-and-blue stereo viewer.